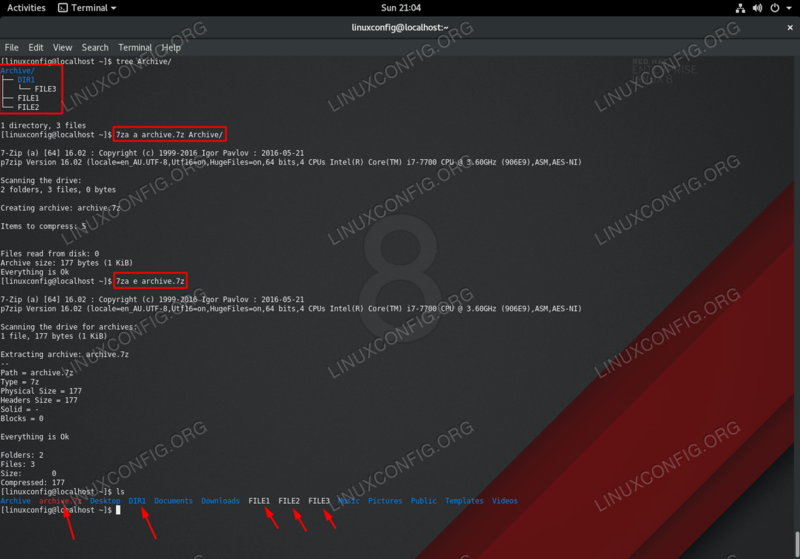 Install P7Zip on RHEL 8. P7Zip is packaged and ready to use in the EPEL. If you don't already have it, enable the EPEL on your system. Now, install P7Zip normally with DNF. If, the EPEL isn't available for some reason, or the package becomes outdated, you can always build P7Zip from its source. It's not an overly large application, so it doesn't take long. Begin by downloading the P7Zip source tarball from SourceForge. Locate and download the latest tarball from the P7Zip repository. Unpack the tarball where you would like to build. You'll need the build tools in order to compile P7Zip. If you haven't already installed them, do a group install with DNF to get everything that you'll need. 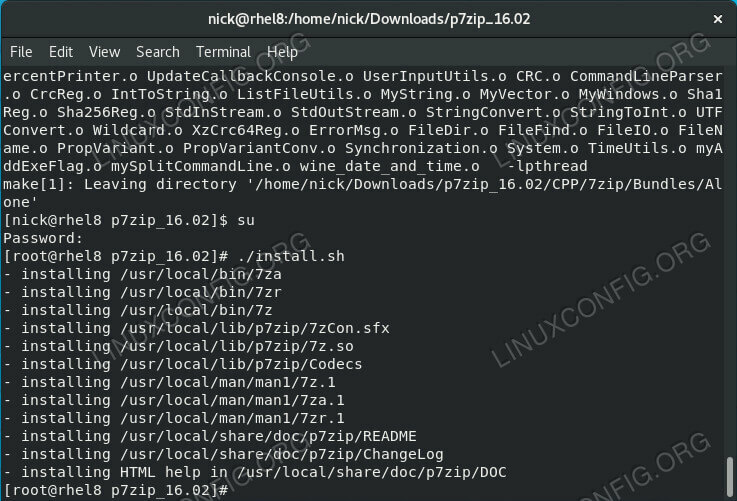 Build and Install P7Zip Now, cd into the source directory that you unpacked. Build P7Zip on RHEL 8. There are a few different ways that you can build P7Zip that contain different sets of utilities and plugins. To get everything, use the all3 option with make. The -j4 flag here tells make to use 4 CPU cores. P7Zip Installed on RHEL 8. 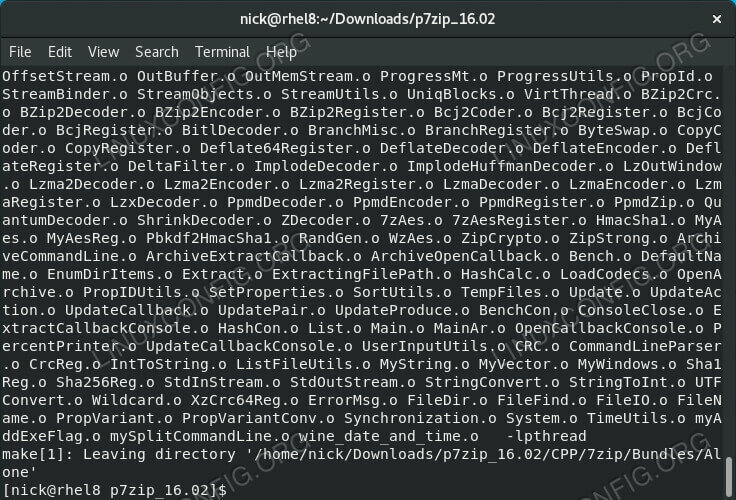 P7Zip provided an install script to put everything that you just built in the correct place. Run it with root privileges to install P7Zip and all the associated plugins that you just built. After it finishes, it'll tell you everything that it installed and where it put everything. Whichever way you chose to install P7Zip, you'll have full access to it and its plugins now. If you opted for the source install, you're going to need to check regularly for updates. You can always uninstall the source build when an acceptable version becomes available in the EPEL.